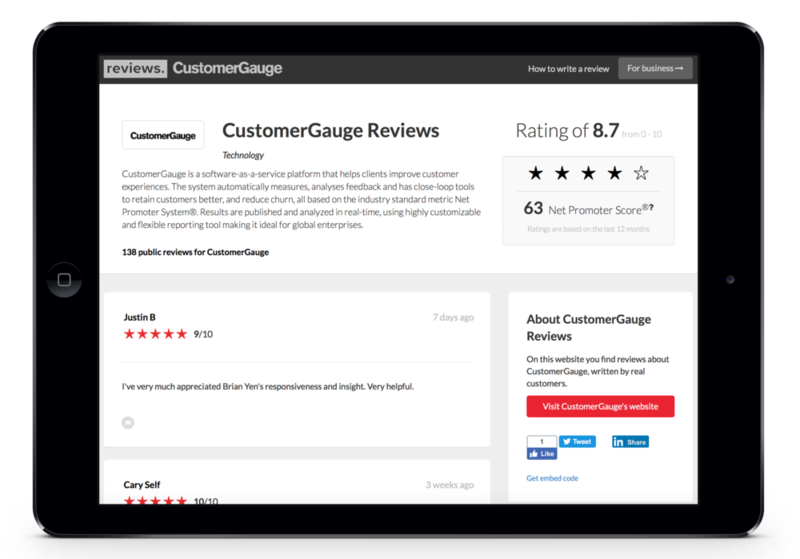 October 10th, Boston - CustomerGauge, the leading SaaS provider of Monetized Net Promoter® and customer retention software, today has announced an upgrade to its CustomerGauge Reviews platform. As part of the new expansion, CustomerGauge now offers clients the ability to setup multiple review sites per brand, product, location, and language to extend their reach and maximize customer testimonials. The new features are available today. Designed for both B2B and B2C global enterprises, the CustomerGauge Reviews platform allows companies to transform customer feedback into reviews, in an instance. For example, upon completing a customer survey, respondents can immediately publish their NPS score and comments to a branded public reviews website. The review pages are indexed by search engines, along with a 5-point star rating. This makes the CustomerGauge Reviews platform the only review system featuring Net Promoter Score, standard star rating and verified customer reviews. Companies can benefit by having a trustworthy stream of user-generated content that boosts Search Engine ranking and helps with referral marketing. The value is not just limited to B2C accounts - CustomerGauge’s fastest growth segment of review clients is in business-to-business. Typically, CustomerGauge drives higher proportion of customer reviews than using other systems thanks to the automated proactive feedback collection system that works on both transactions and relationships. NPS survey-to-reviews conversion rate is very high - with a median in the range of 20-30%, and with some clients up to 40% of all survey feedback results in reviews. This mechanism helps to drive volume: several clients have reviews numbering in the thousands, with one site carrying more than 30,000 customer reviews. Built into the CustomerGauge Reviews system is a full workflow to acknowledge customers, support rebuttals and content monitoring. Moreover, CustomerGauge ensures all reviews are written by real customers. Unlike other systems that invite public reviews, CustomerGauge guarantees enterprises have full ownership and control of their data. - Multi-brand/location: Depending on the breadth and complexity of their business, organizations might want to setup multiple review sites for the different brands or locations they survey customers. This gives the ability to have a dedicated customer reviews platform for specific product and service offerings. - Multi-language: Enterprises can easily configure their reviews platform to support the local languages of their audience—making customer advocacy truly international. CustomerGauge customers have already benefited from increased referral traffic. If you’d like to learn more about the CustomerGauge Reviews platform please contact sales@customergauge.com. CustomerGauge is a software-as-a-service platform that helps clients improve and monetize the customer experience. The system automatically measures and analyzes feedback, reduces churn through close-loop tools, and helps retain customers using the industry-standard metric Net Promoter System. Results are published and analyzed in real-time, using a highly customizable reporting tool, making it ideal for global enterprises. For more information, visit www.customergauge.com.